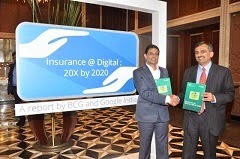 According to a study conducted by Google India and Boston Consultancy Group (BCG), about 75% of total insurance policies will be sold through online route by year 2020. The report titled “Digital@Insurance-20X By2020" was released recently in Mumbai claims that as many as three out of every four insurance policies will be sold online in next 6 years. The report claims that the online insurance market in India will cross Rs 20,000 crore, about 20-folds its current value of Rs 700 crore by year 2020.